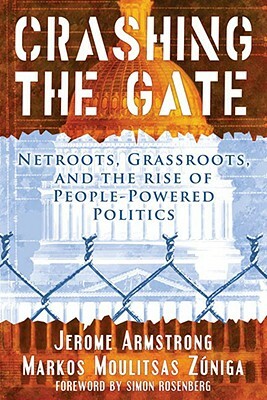 "Crashing the Gate" is a shot across the bow at the political establishment in Washington, DC and a call to re-democratize politics in America.This book lays bare, with passion and precision, how ineffective, incompetent, and antiquated the Democratic Party establishment has become, and how it has failed to adapt and respond to new realities and challenges. The authors save their sharpest knives to go for the jugular in their critique of Republican ideologues who are now runningand ruiningour country.Written by two of the most popular political bloggers in America, the book hails the new movementof the netroots, the grassroots, the unorthodox labor unions, the maverick big donorsthat is the antidote to old-school politics as usual. Fueled by advances in technology and a hunger for a more authentic and populist democracy, this broad-based movement is changing the way political campaigns are waged and managed.A must-read book for anyone with an interest in the future of American democracy. Keywords: POLITICS. INTERNET. BLOGGING. WEBLOGS. DEMOCRATIC PARTY. PROGRESSIVE.